Rhodes island offers a beautiful mix of stunningly wonderful, long stretches of beach, ready to accommodate any type of preference. Surrounded by crystal clear waters, Rhodes is home to some of the best beaches in Europe. Given the varying topology, geology and tourism infrastructure of Rhodes, all beaches have their own unique character. That said, we love all of Rhode's beaches! Whether you are looking for a family and kid friendly beach with all the facilities, a world-class surf spot, a beach just to yourself, or whether you prefer your beach pebbly or sandy, you'll find it here. We have listed all beaches with photos, reviews, maps and your ratings and comments. We hope you will enjoy browsing these beaches. The northwestern side of the island, from the City of Rhodes and the cosmopolitan Ixia down to Mandriko and Skala Kamirou (Kamiros Scala), boasts of large beaches developed for tourism. On the Southeastern shore, there stand out the equally developed beaches at Kallithea, Afandou, Tsambika, Vlycha, Lindos, Lardos and Gennadi. Around the island, as a whole, you will find many small sandy coves, almost hidden, such as Glyfada, Paliochora, Kopria, the small beaches of Monolithos down to Kalamos, Kerameni Bay and the exotic beaches of Prasonisi. The west coast of Rhodes is frequently swept by shore winds, and can be rough, but is a windsurfer's paradise. 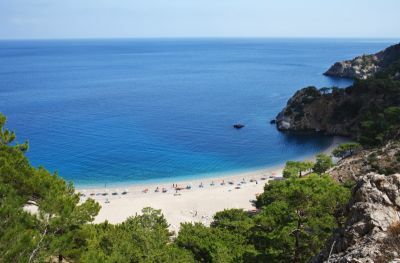 35 beaches in Rhodes were awarded in 2018 with “Blue Flags”, an international program coordinated by the Hellenic Society for the Protection of Nature (HPSN). The “Blue Flag” is an international symbol recognized worldwide defining environmental quality. The beautiful sandy beaches of Lardos are known as some of the best beaches on the island. You will find crystal clear waters here - it is a Blue Flag awarded beach, situated on southern end of Pefkos bay. A long, broad beach with fine, golden sand and dozens of colourful little flags marking out the various eating establishments and beach sports centers. Tsambika is one of the most beautiful beaches on Rhodes. Sandy beach with shallow sea water has length of about 1km. It is located in an attractive and quite tourist resort 3 km away from the village of Lardos.